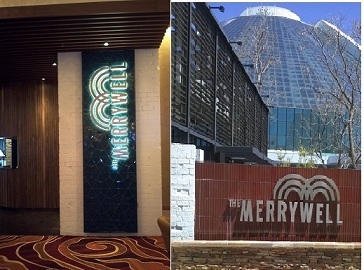 Several new restaurants have opened since the re-branding of Burswood Resort as Crown Perth but The Merrywell seems to be getting the most publicity for its dude food specialties. 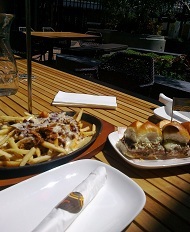 I'd read about this USA-inspired trend, so when the dude in my life had a day off we decided to check it out for lunch. We entered The Merrywell from the casino and it's like walking into another world. It's a stylish semi-circular space along the edge of the building with the bar a few steps down to the left and a tier of seating along the windows which look out on the beer garden. 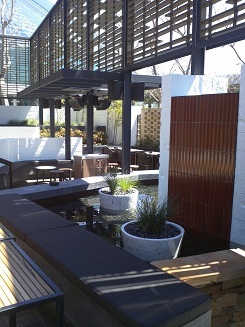 The beer garden itself is a gem, with seating scattered among bamboo and fountains. It feels like a private courtyard despite the road that runs alongside. There's also an entrance there for those who don't want to visit the casino. It wasn't very crowded when we arrived. There were several staff members around but none came forward which I found a bit annoying, as we didn't know if we could just take a table or had to wait to be seated. 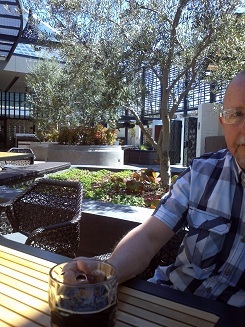 Finally we asked and found we had to order at the bar as we intended to eat in the beer garden. There are three menus: the basic Merrywell, an expanded Dinner menu, and a selection of Bar snacks. I'd intended to order the deep-fried macaroni and cheese balls I'd heard about, but was seduced by the sight of some chilli-cheese French fries as we made our way to the table. We ordered those ($15) and the trio of Wagyu Mini-Beef Burgers ($21) along with a bottle of James Squire porter ($9) and a lemon squash ($3.50). The food arrived quickly (before the silverware in fact - we had to ask for it). The wagyu mini burgers were delicious. The beef was rich and tender, the rolls fresh and the onions and relish made a tangy topping. The chilli-cheese French fries were outstanding. This is re-invented junk food at its finest. The thin fries were crisp, salty and topped with chilli that was perfectly seasoned, hot enough to notice but not enough to kill the flavour. It was finished with cheese and chopped Spanish onion and I could have eaten the whole plate myself. We enjoyed our visit, but it's clear that The Merrywell is best experienced with a group. Most of the food comes on share platters and cocktails can be purchased by the litre. I found the contrast between the fashionable understated venue and the frat-house menu a bit odd but the pub does say it offers food with "a daring twist". 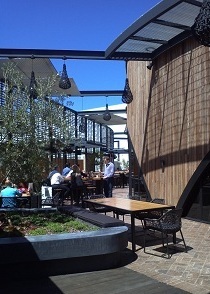 There were a few service hiccups but during our visit both the Venue Manager and the CEO of Crown Perth were chatting with customers, indicating the level of commitment to the operation. The Merrywell gets very busy at night and on weekends and large groups are advised to book.